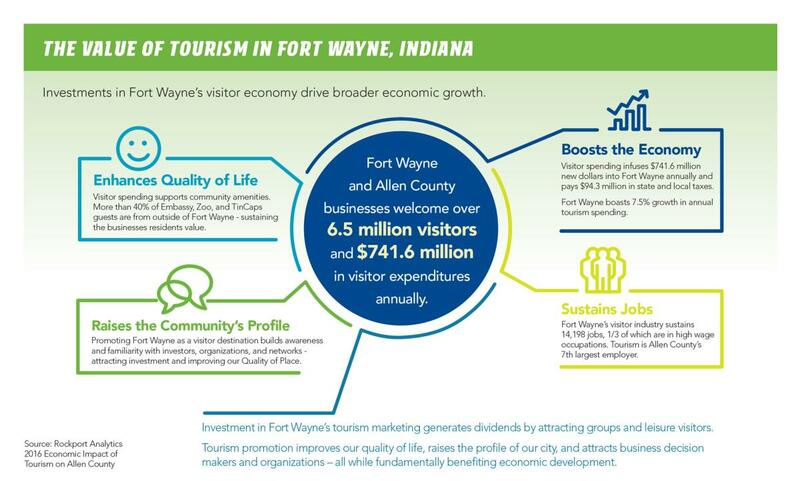 The tourism industry is very important to Fort Wayne&apos;s economic growth. 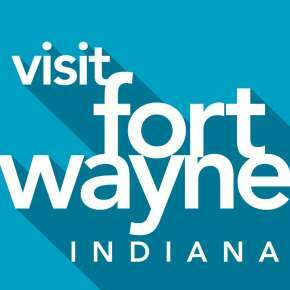 Here are ten reasons tourism is important to Fort Wayne. Fort Wayne&apos;s tourism industry sustains 14,198 jobs in Allen County - jobs that would not exist without tourism. What&apos;s more, over one-third of the jobs resulting from tourism spending were found in professional or managerial positions. These jobs provide nearly $200 million in wages to Allen County workers and create a more prosperous job market for our community. A vibrant business environment is supported by a vibrant tourism community. 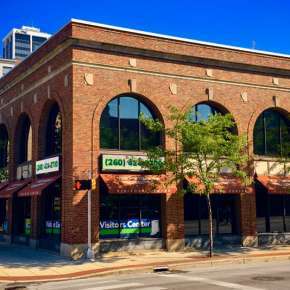 In Fort Wayne, you&apos;ll find new and exciting additions around every corner, from the Grand Wayne Convention Center and Allen County Public Library downtown, to private investments in facilities like Crazy Pinz and Spiece Fieldhouse. All of these facilities (and hundreds more) are local favorites, but they thrive on the financial support of visitor spending. Visitors who attend our conventions, museums, and festivals bring added vitality to our downtown landscape. Without their presence (and their visitor spending) in these facilities and events, our community wouldn&apos;t be nearly as rich - visitor spending is helping build a downtown that we can all enjoy. That&apos;s right - visitors to Allen County generate over $94.3 million in state and local taxes. These taxes (paid by food and beverage, hotel, airport, car rental and other purchases) are cycled into our local economy, easing the tax burden for those of us who live here. In fact, for every dollar spent on tourism promotion and marketing by Indiana&apos;s Convention and Visitors Bureaus, roughly $15 in taxable revenues is generated. 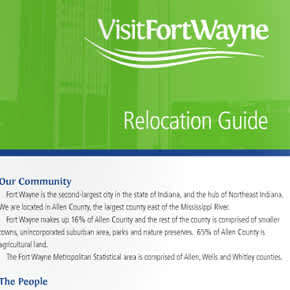 Visitors spend over $741 million a year in Fort Wayne. This tourism spending breathes life into a community as convention delegates, genealogy researchers and families in town for a youth soccer tournament all support our restaurants, hotels, attractions, shopping and facilities. Our quality of life is enriched as their spending supports our facilities - creating a better city for all of us to enjoy. Concerts, sporting events, festivals and other special events all rely on visitors as well as residents to attend their events. Everyone receives an improved quality of life when visitor attendance helps bring bigger groups and better entertainment to our world-class facilities. Visit Fort Wayne continues to play an important role in bringing great youth sports tournaments to Fort Wayne - from NCAA tournaments to Big Ten Soccer - providing additional spectator events for the whole family. Whether they come to Fort Wayne to play hockey, soccer, softball, participate in a bowling tournament, or even host a national USA Roller Sports Championship, visitors provide us with a rich assortment of entertainment options that are open to the public! Just as you try to capture market share in your business, we work to create destination appeal. Each year, our budget is spent in an effort to promote Fort Wayne as a destination for conventions and leisure travel. Through this promotion of our community, we have helped "brand" your community more positively, which helps benefit everyone&apos;s corporate image. In the 21st century, eight out of ten jobs will be in the service industry, which is why we focus on creating a vibrant economic machine that will help support this dynamic industry. Over $150 million has recently been invested in Fort Wayne&apos;s tourism assets, with $75 million being invested in public facilities and another $75 million of private sector investment being spent on hotels, entertainments centers and businesses. This investment is being made in our tourism industry because it pays. Over the next few years, as we see additional public and private investments throughout Fort Wayne we can remember: the visitor industry is helping build a better Fort Wayne. Even in a tough economic climate, jobs in the tourism industry are on the rise in Fort Wayne. Our affordability and high quality of life and amenities are reasons that visitors come to Fort Wayne and return year after year! 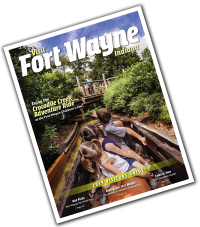 In fact, Fort Wayne&apos;s visitors are consistently impressed with the quality of our attractions, world-class amenities, and top-notch meeting facilities. It&apos;s something we can all be proud of!